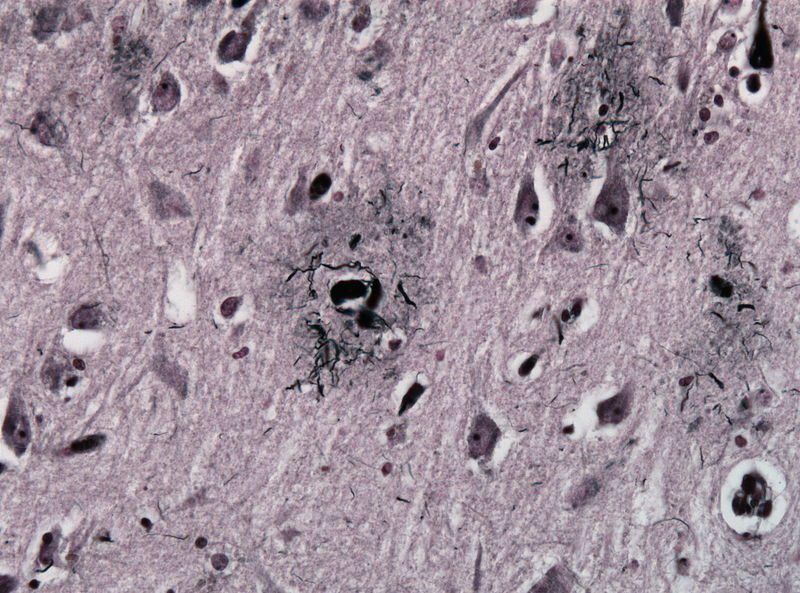 The Gallyas Silver stain is a classic neuropathology method used for the detection of neurofibrillary tangles. Before beginning, make sure that all glassware is acid washed. Avoid the use of metal containing materials in this procedure; use only plastic forceps, gloves and staining racks. Alkaline silver iodide solution. Add the reagents below in series. Dissolve the sodium hydroxide in water then add the potassium iodide and wait till dissolved. Slowly add the silver nitrate and stir vigorously till clear. Add distilled water to give a final volume of 1000ml. Stock Solution II. When preparing Stock Solution III, dissolve each reagent consecutively (in series); wait for complete dissolution before adding the next ingredient. Stock Solution III. When preparing Stock Solution III, dissolve each reagent consecutively (in series); wait for complete dissolution before adding the next ingredient. Developer Working Solution: Add 3 volumes of stock solution II to 10 volumes of stock solution I. Stir to ensure complete mixing, and then add 7 volumes of stock solution III. Stir and wait for the solution to clear. After deparaffinizing sections, immerse in distilled water. Place in 5% periodic acid for 5 minutes. Wash in distilled water for 5 minutes. Place in alkaline silver iodide solution for 1 minute. Wash in 0.5% acetic acid for 10 minutes. Place in developer solution (prepare immediately before use) for 5-30 minutes. Wash in 0.5% acetic acid for 3 minutes. Place in 0.1% gold chloride for 5 minutes. Rinse in briefly distilled water. Place in 1% sodium thiosulphate solution for 5 minutes. Counterstain in 0.1% nuclear fast red for 2 minutes. Dehydrate slides through a graded series of ethanols (70%, 80%, 95%, 100%), for 3 minutes each, and then clear slides in 2 changes of xylene solutions. Mount slides using a high quality xylene-based mountant. Positive stained structures will be black, and include neurofibrillary tangles, neuritic plaques, and neuropil threads. Nuclei will be stained red by 0.1% nuclear fast red. Gallays silver stain in a brain tissue specimen displaying a neuritic plaque in the center . Source: Jensflorian; Wikimedia. This protocol is based upon a published procedure by Jim Lowe at the University of Nottingham.